The Rise and Fall of Adam and Eve, a new study by Stephen Greenblatt, is the subject of an interview broadcast today on Forum, a production of KQED Radio in San Francisco. You can listen to the interview here. 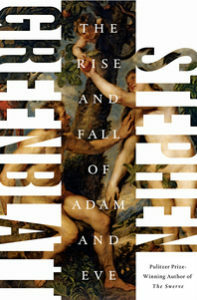 The Rise and Fall of Adam and Eve explores the enduring story of humanity’s first parents. Tracking the tale into the deep past, Greenblatt uncovers the tremendous theological, artistic, and cultural investment over centuries that made these fictional figures so profoundly resonant in the Jewish, Christian, and Muslim worlds and, finally, so very “real” to millions of people even in the present. With uncanny brilliance, Greenblatt explores the intensely personal engagement of Augustine, Dürer, and Milton in this mammoth project of collective creation, while he also limns the diversity of the story’s offspring: rich allegory, vicious misogyny, deep moral insight, and some of the greatest triumphs of art and literature. Stephen Greenblatt, winner of both the Pulitzer Prize and the National Book Award, cofounded Representations, where many of his essays have appeared.